I was finally able to get my hands on some of Endangered Species Chocolate’s new filled chocolate bars which I had wanted to try since I first heard about them a few months ago. I picked up both the Almond Butter Creme Filled bar and the Sea Salt and Lime Filled bar. As you can see in the photo, the filling is a thin layer sandwiched between two substantial layers of dark chocolate. The filling is also quite solid, which keeps things from being messy. Overall I liked the filling, but I think it was overwhelmed by the dark chocolate. I think this would have been more successful with a greater filling to chocolate ratio. One thing I really liked about these bars was the touch of salt that really brought out the chocolate flavor. I’ll probably pick up the other flavors to give them a try, and I liked the Almond Butter Creme bar enough to get it again. 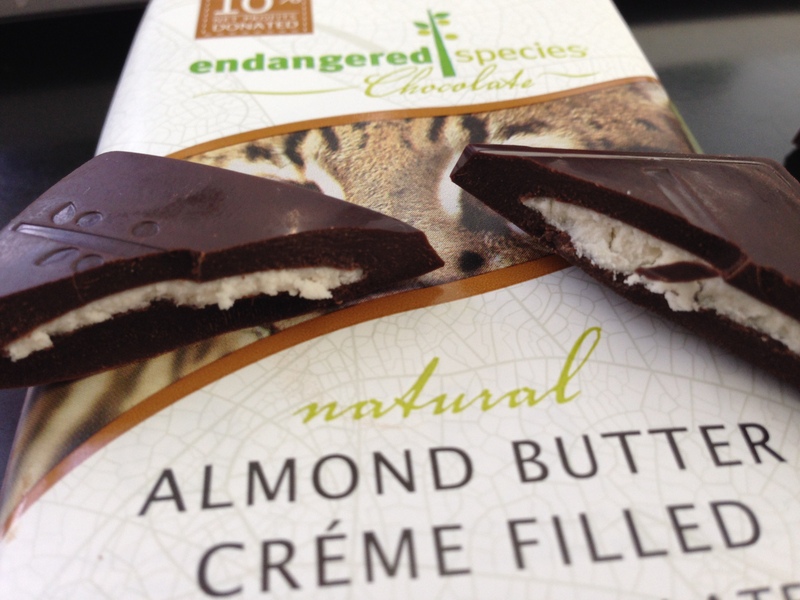 You can check out all the new flavors at the Endangered Species website.